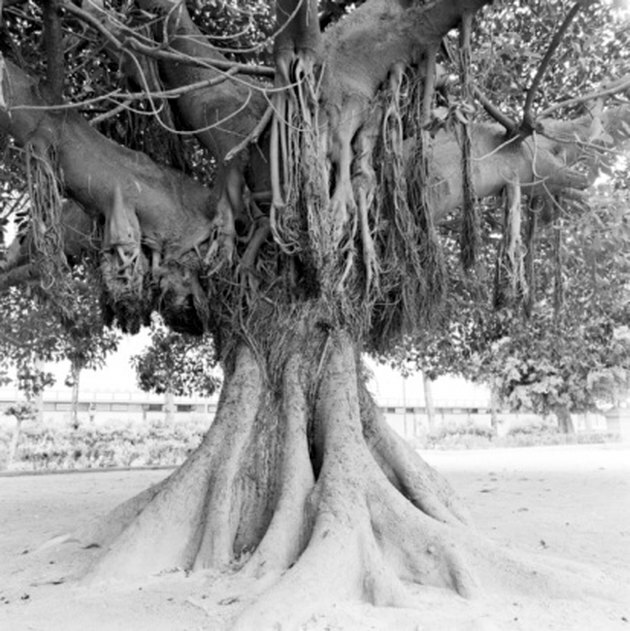 The Banyan tree is a close relative of the fig tree and a larger version of the ficus tree. These trees have large, thick roots that protrude from the trunk. The Banyan prefers warm, tropical weather, as frost can kill it. When full-grown, its leaves can be 10 inches long. Growing a Banyan tree from a seed requires starting it indoors and letting it grow into a seedling before replanting it outdoors. Banyan trees can grow to 100 feet tall. Slice the plastic milk jug in half with the scissors. Discard the upper half. Place the bottom half on a flat surface. Pour 6 inches of potting soil into the bottom section of the milk jug. Use your fingers to even out and lightly pack the soil. Once it is set, poke a 2-inch hole into the top center of the potting soil. Place a Banyan tree seed into the hole that you have just created in the potting soil. Cover the seed entirely, but do not tightly pack the soil over it. Pour the water into a glass. Scoop up some of the water with your hand and gently flick the water over the seed implanted in the soil. Do this several times until the water is moist, but not soaked. Pouring the water directly from the glass over the seed may displace it or drown it. Check the soil every day, making sure to keep it moist. After a week you will see tiny green shoots starting to poke out of the soil. Once the tree seedling is 3 inches to 4 inches tall, it is ready to be transplanted outside. Find a location in your yard for the tree. Banyan trees need full sunlight or partial shade and must have an open 4-foot to 5-foot diameter around it so that it has room to grow. Dig a 6-inch hole in your yard with the trowel. Carefully remove the seedling from the milk jug and place it in the hole in ground. Gently fill in the hole, making sure to not cover the Banyan tree. Sprinkle some water over the seedling.